It’s Monday Morning. I’m sitting in the middle of the line up and over the sound of the waves rolling and the movement of the ocean I hear “I, am an F.B.I. Agent!” This Northern San Diego surfer is not only quoting a classic surf film Point Break, but he is quoting the live-action stage show about the iconic surf film, Point Break Live! Point Break Live! is an interactive-improvisation-stage-show-party that is hilarious, extreme, massively entertaining, incredibly impressive, and 100% pure adrenaline! Point Break Live! 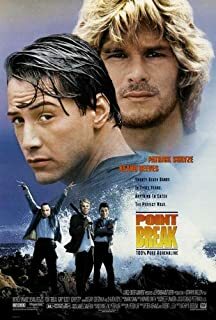 is a spoof on the 1991 classic film, Point Break, starring Keanu Reeves as Johnny Utah, a former football player / undercover FBI agent, turned surfer bro by a group of adrenaline surfers who double as bank robbers to pay for the search of the perfect wave. This group of Ex-Presidents, (their bank robbing group name) is led by Bodhi, played by Patrick Swayze, a wise Zen-master local surfer with hair flow like no other, who lives to search for that once in a lifetime opportunity, man! Point Break reached cult like status because of its crazy plot line, outrageous acting, and insanely quotable dialogue. Point Break Live! takes this iconic cult film and put a unique spin on the movie and classic theatre all together by engaging the audience during the show and allowing a random person chosen by the crowd, to play Keanu Reeves. The show starts with the “director” of the movie Point Break, leading the crowd through the selection of the star of the show. Anyone can go on stage to try out, and it ranges from people who brushed up on their Keanu impressions that day to men who can’t even speak English. While the chosen Keanu is guided through the show by cue cards, the real reason that this random audience member is able to survive an entire play and pump out the role of a lifetime, is because of the insane amount of talent that the surrounding actors have on stage. It is obvious upon seeing the show and cast for their characters and the true actors they are, that there is a special bond between them all. The passion they pour into Point Break Live! shines through in their excitement and commitment to the show. This cast channels their inner Bodhi because “if you want the ultimate, you’ve got to be willing to pay the ultimate price. It’s not tragic to die doing what you love.” The actors of Point Break Live! love what they do and are going out on top. Ps: If you wish to see Point Break Live! they will be doing one more show in San Diego at Belly Up on June 19th. They will also be playing in San Francisco May 6th and June 3rd while playing Saturday’s in LA until June 25th. Don’t miss your chance to see this stellar cast and performance! You should also be stoked to hear their new show, Terminator Too: Judgement Play will be pumping out shows soon! They will be playing Belly Up on May 1st and continuing this unique interactive theatre party!